Moving to a new city: How can you make it easier for your kids? Moving to a new city could be an exciting or stressful activity for you. But, it could become a nightmare for your lovely children. Here, you and your life partner act as the main deciding authority to plan about your move and there is no need for you both to bother about your child’s interests. Your kids may have their likings, preferences, and choices. They may require some time to understand and to get adjusted with your shifting task. When you want to move to a new city, it is essential to make a move easier for your kids, and you should perform some things based on their interests and needs in advance. So, to make your kids understand and to feel more comfortable about your shift, follow these below-given ideas. Most kids grow by following some routine habits and by watching some familiar things. Before planning your move, consider the advantages you get from your living environment, surroundings and the social life of your children. When your family has met with any life twisting incident like death or divorce, it is better to postpone your move to give your children some more time to adjust to their situation. Sometimes, you have to perform a move, due to any financial trouble or employment transfer even though you are not interested. Try to take things positively as your attitude and mood could largely affect your children’s lives during any relocation. It is necessary to talk about your move with your children and make them understand any situation. When it is a local move, take your kids to your new locality and house to become familiar with new places in the house and to plan themselves according to their self-interests. When it is a domestic shift, provide lots of details on your new house, city, state or county, as much as possible. Try to provide more information about your new home, locality, and people. Allow them to access the internet to find a lot about your shift and the new neighborhood. Give them the opportunity to ask you more questions about the move and answer them clearly and completely without any hesitation. Try to handle the situations during your move based on their positive and negative reactions. When your relocation happens for a good reason, your children don’t understand your situation, and they are usually worried about the sudden changes that supposed to occur at your new destination. Allow your children to get involved in your moving plan because it would make them feel more thrilled about their new home. Also, you can provide some information on how and when you have planned for a move. During this age period, your children might be babies, toddlers or preschoolers. Normally, in this age group, your kids don’t understand about your situation, and you have to plan your move without your kid’s knowledge. But, it is your responsibility to fulfill the basic needs of your kids, even they are not involved in your moving decision. Tell them some interesting stories and show books regarding shifting. Try to explain to them simply about how the moving process happens with the help of any pictures or images. When packing your kids item, try to explain to them what you are doing and make them understand that their clothes and toys are not being thrown away. Keep your kid's familiar products such as large toys, bedroom furniture and more, until they get settled in your new home. During this age period, your children would be middle-aged school kids. Generally, they are much excited and open about your relocation plan. Try to include them in all possible activities of your moving, to provide them few responsibilities on packing their items. Another big problem is about changing their schools. Try to collect more details about their new school by doing research and get some documents like the previous school’s workbooks, reports, test papers, etc., as required by their new school. Your move might take place during any time of the year, and you should make reservations for new school seats. According to kids, it’s their new place, new school, new friends, new teachers and a lot more. During this period, your children would be teens studying in high schools. Usually, they are more sensitive about your relocation decision, and they are closely involved with their friend's community and social groups. This change would create a great impact on their personal life, and it would affect their exams in school as well. It is good to allow your children to stay in your old place with any of your friends or relatives until their exams are over. Try to make them understand that moving is a part of everyone’s life and let them know they will also face these situations in the future like to move for their higher education, new job, and travel. If you are planning to move during their vacation time, you can involve your children in your moving activities and make them take some responsibilities such as packing their items, helping you with cleaning, organizing the goods, etc. By doing this, your children can be able to take a few good decisions on their own which are very important for their life. On your moving day, request your friends or relatives to come along with you to take care on your small kids, as you and your partner can’t handle your kids for long on this particular day. Although you have booked for a professional packer and mover to move your goods, you should keep your essentials and first night box prepared on or before your moving day. Below given are some essentials suggested for you to pack in a separate box to perform your relocation fast and safe. Special child seat for your car. Additional garbage bags to put those dirty diapers. First aid kit along with some essential medications. Toys and pack n play items. Feeding bottle with any pacifier and breastfeeding pillow. 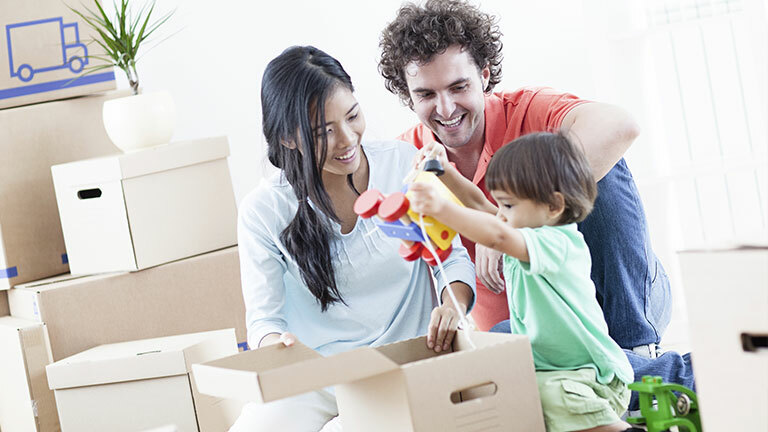 On the night of your relocation day, first plan things necessary for your children at your new home. If your kids are grownups, ask about their interests and allow them to make their own choices in setting up their new room. By this activity, your kids would get attached to the new environment, and they even feel more familiar with things at your new home. From the next day, after you have relocated to your new home, you should try to make some more arrangements for your kids to get adjusted with their new surroundings. Below this age, your kids can't understand new things, and you have to find out what suits them better. Make them return to their following routine habits such as play times, sleep times, food and other activities, as soon as possible. When you find the time, set up a play area in the backyard to play and spend some time with your kids. During this age, take your children a tour around the new house and allow them to explore some fun-filled places like backyards, storerooms, attics, stairwells, hidden doors, etc. If your children feel eager to unpack their living room items, let them unpack their belongings and find out their areas inside their room to place their toys, books, pictures, etc. Let them pick their paint color for their lovely room as well. If your children are going to join a new school, make sure that they get familiar with their neighborhood and get involved in any extracurricular activities. During this age, your children are grownups and old enough to understand things. Make them get introduced with your neighbors and their children to find their new playmates and explore the neighborhood. Allow them to find their new fun places, playgrounds, ice cream shops, sports clubs, etc. Also, give them some responsibility to fetch necessary things for your home such as groceries, products, vegetables, etc., so that they are able to research things available in their new neighborhood.